Alpha linolenic acid (ALA) and linoleic acid (LA) are polyunsaturated fatty acids (PUFA) of the omega 3 and 6 family respectively, and are both essential to health. These fatty acids have a number of important function in humans, and deficiency of either results in degeneration, disease and ultimately death. One of the most important functions of the essential fatty acids is the production of eicosanoids via a series of enzymatic reactions. Eicosanoids are short lived hormones that modulate inflammation, immunity, platelet aggregation, cellular growth and cellular differentiation. Plants produce ALA and LA, and humans then consume these fats in their diets. In humans, ALA and LA are converted to dihomo-γ-linoleic acid (DGLA), eicosapentanoic acid (EPA) and arachidonic acid (AA), which are the final precursors to the formation of eicosanoids. Dietary sources can also provide EPA, DGLA and AA directly. The formation of eicosanoids from the essential fatty acids is shown in figure 1. Fatty acids are stored in membrane phospholipids and the formation of eicosanoids begins with liberation of the relevant fatty acid from the membrane by the action of a phospholipase enzymes. The liberated fatty acid then serves as a substrate for a number of cyclooxygenase or lipoxygenase enzymes. Conversion by a cyclooxygenase give rise to eicosanoids called prostaglandins and thromboxanes (prostanoids), whereas conversion by a lipoxygenase gives rise to eicosanoids called leukotrienes. The fatty acid profiles in the membranes of cells and the type of cell are the primary determinant of which eicosanoids will be produced. Arachidonic acid is the major PUFA in cell membranes and so the majority of eicosanoids produced will be series 2 prostaglandins and thromboxanes and series 4 leukotrienes, which generally have a pro-inflammatory disease promoting effects. Figure 1. The metabolism of the essential fatty acids to form eicosanoids. LA, linoleic acid; ALA, alpha linolenic acid; GLA, γ-linolenic acid; DGLA, dihomo-γ-linolenic acid; AA, arachidonic acid; EPA, eicosapentanoic acid; ETA, eicosatetraenoic acid; SA, stearidonic acid; DHA, docosahexanoic acid; PLA2, phospholipase A2; LOX, lipoxegenase; COXs, cyclooxegenases; HETE, hydroxyeicosatetraenoic acid; HEPE, hydroxyeicosapentanoic acid; HPETE, hydroperoxyeicosatetraenoic acid; HPEPE, hydroperoxyeicosapentanoic acid; LT, leukotriene; HODE, hydroxyoctcadecadienoic acid; PG, prostaglandin; TX, thromboxane. In contrast, EPA is a precursor to the series 3 prostaglandins and thromboxanes as well as the series 5 leukotrienes. Generally EPA produces prostanoids and leukotrienes that are fairly neutral in their inflammatory effects, but they reduce inflammation because they reduce the conversion of AA to the series 2 prostanoids by competing for the cyclooxygenase and lipoxygenase enzymes. High intakes of fish derived EPA also decreases the membrane concentration of AA, further reducing the likelihood of the formation of the series 2 prostanoids and series 4 leukotrienes. 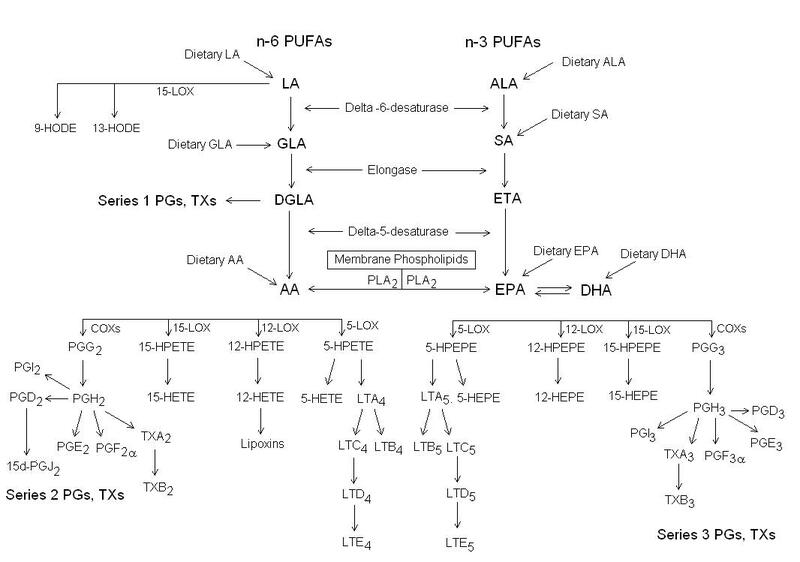 Also, n-3 fatty acids have a higher affinity for the elongase and desaturase enzymes than the n-6 fatty acids and so intakes of ALA reduce the conversion of LA to AA thus decreasing membrane concentrations of AA. Lastly, n-3 fatty acids increase the catabolism of eicosanoids through the action of peroxisomal enzymes. It has been estimated that EPA and its precursor DHA have approximately 5 times the potency of ALA with reference to the suppression of AA derived eicosanoids. Another way that fatty acids can decrease tissue inflammation is by formation of the series 1 prostanoids (prostaglandins and thromboxanes) which are formed from the n-6 fatty acid DGLA. The series 1 prostanoids decrease series 2 prostanoid formation by competition for the cyclooxygenase enzymes, as well as being potent anti-inflammatory compounds. Evening primrose and starflower oil provide sources of the DGLA precursor γ-linoleic acid (GLA). Foods such as red meat, dairy products and eggs provide the body with AA which is incorporated into membranes and increases tissue inflammation, particularly in an absence of adequate EPA or other n-3 fatty acids. Anti-inflammatory diets must therefore limit intakes of these foods. This entry was posted in Alpha Linolenic Acid, Arachidonic Acid, Dihomo Gamma Linolenic Acid, Docosahexaenoic Acid, Eicosapentaenoic Acid, Essential Fatty Acids, Gamma Linolenic Acid, Linoleic Acid. Bookmark the permalink.